After four long years of war and suffering, peace has finally come to the United States in 1865. Lieutenant James Bethune McNeil is coming home to West Meredith in Delaware County, New York. Throughout the war he served his country as a volunteer in a New York infantry regiment. He saw some of the worst fighting of the war; The Seven Days and Malvern Hill, Second Bull Run, Fredericksburg, Chancellorsville, Gettysburg, The Wilderness, and Petersburg. He is haunted by the sights, sounds and memories he witnessed in the war. Like most of the soldiers who are returning that spring, he must find a new life now. He had gone to war because his home life had become impossible to endure. Is it possible to take up where he left off? Should he stay and try to make a better life or should he move on, go out west for a new start? For Jamie, it is a new chance at the happiness that has always been out of his reach. But he carries those burdens of war with him wherever he goes and they have the power to destroy him. How can he envision a future? Is the steadfast love of his sweetheart, Mary Edwards, enough to see him through? He has returned from war, broken and scarred, and forced to take up civilian life again. He had once called himself "a bit of wreckage." Can he be saved? 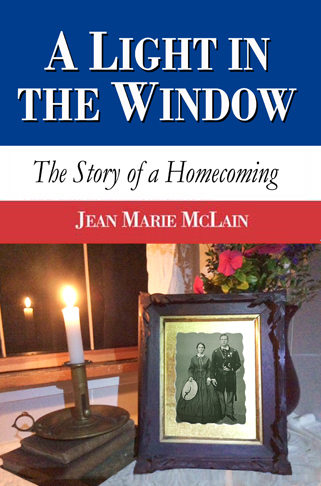 A Light in the Window is intended as a sequel to Jean Marie McLain's first novel, As Best We Could. The story can be read as a continuation of the first story, or it can be read as a stand-alone story of its own. Her first novel received enthusiastic reviews from her readers. To learn more about As Best We Could click on this title. Book Signing - Photo of the launch of As Best We Could book signing. Read! - What readers are saying about As Best We Could. Buy both A Light in the Window and As Best We Could together for a discounted price. NOTE!!! This version can be viewed on your computer or any Macintosh devise (iBooks); It DOES NOT work in the Kindle app.